Have I missed them this time around? Seen them twice before in Oxford. But I guess they are a bit too big to be playing the Academy again any time soon. Didn't even realise they where touring atm. I attended their concert in Cologne yesturday, and I really enjoyed it! Unfortunatly they could only play during 70mins. The fact that they had two support bands seems to have a negative impact on the length of their show . But their performance was really nice! Cristina was amazing, she delivered a very good show! Her vocals were great, and she brought a lot of energy on stage. I couldn't hear Andrea well yet. Is his voice way less powerful than Cristina's voice or did he merely have a bad sound? The guitarist and drummer sounded well; their bassist was ill so a replacement bassist played with them. Yet if they wouldn't have said it, I wouldn't have noticed. He seemed to fit quite well in the band. As for the setlist, they played the "hits" from their previous album (Heaven's a lie, To the edge, Spelbound...) and many songs from their last album. I hadn't heard Broken Crown Halo, and I have to say that I really liked the new songs! Now I know what to put on my list for Santa Claus . I also had the feeling that their songs sounded heavier live than on the albums, which -from my point of view- is a great thing. So all in all, I thin it was a great show. That's just a pity that it was so short. I've listened to Lacuna Coil and I like the singers Cristina and Andrea. They are nice band but I don't listen them often, their music is not for my taste. Lacuna Coil might have a new album out this year. So excited!! Especially if they will get heavier. "Broken Crown Halo" was a fantastic album, so I hope they follow that path into the next one, at least on some level. I don't listen to them anymore nowadays.. It seems to me that I lost my enthusiasm with this band after Karmacode. Although I like Dark Adrenaline and kinda like Broken Crown Halo but both albums didn't have that "melancholic" feeling that their first albums offer. Okay, it's a new music direction but I think it didn't fit Cristina's voice IMO. It's true that their albums have no more kind of melancholy, but Broken Crown Halo is nice album. My favourite song from Lacuna Coil is Within Me. Nice to hear that they have album coming out this year, I hope it will be good! I'd definitely check out the new album when it came out and hopefully it'll be at least as good as Karmacode. On the new album I like some few songs especially One Cold Day. If I'd name my favorite song, that would be The Ghost Woman & The Hunter. This song is just timeless and still gives me the feels everytime I listen to it! Cristina wrote this on FB concerning the Paris attacks. Sorry I don't know how to get the picture onto the Forum. It is a picture of the Le Bataclan club with Lacuna Coil on its marquee. I stole this pic from my friend Jeremy. We played at Le Bataclan in the past, we played there as hundreds of other bands. Yesterday night people who just wanted to spend an evening having a good time going to a concert, got killed (not to mention every other person who got killed in the rest of the city and at the stadium). I will not spread any hate or racist messages as this is exactly what these criminal wants, in between every other thing they are trying to accomplish. in every religion there's always the extremists who thinks that "God" (whatever their God is), would allow them to spread death and sadness and reward them for it. If there is a God he would and he will despise you. At the end of the day, It could have been you, it could have been me instead of these poor victims. Enjoy every single second in life because it could really be the last. This was posted on their Facebook page. Lacuna Coil's facebook page got hacked (so did Cristina's). It's not loading for me anymore. Hopefully, it gets fixed soon or they might have to start a new account all together. FB name has been changed to "Lacuna KING". Apparently they have nothing better to do with their lives. I hope they can fix it as soon as possible, or they'll have to create a new account. I feel for them so much! Just glad they see the positive side (that the media has taken notice and started writing about them again!). Good or bad, publicity is publicity, and I long for the next album even more now! The hacking incident finally seems to be completely and totally over. At one point, Cristina and the band thought it was, then the hacker came back for another round. However, there doesn't seem to be anymore spamming happening at all now, thank the lord. 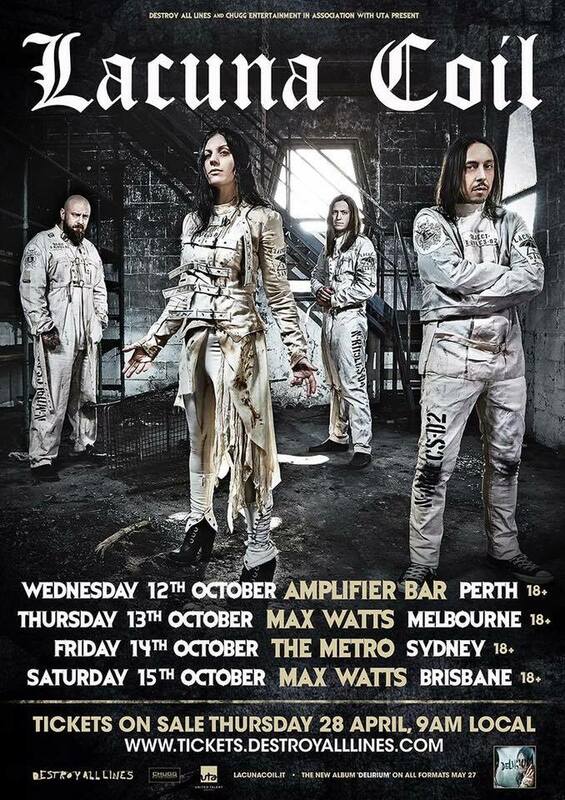 Also, some sad news - it appears Marco has left Lacuna Coil. However, it's all on good terms. I wish both him and LC the best and I'm stoked for "Delirium" and whatever Marco decides to do next! Oh, and I'm also looking forward to any future US tours. I saw them for the first time in October 2014 when they were supporting "Broken Crown Halo" and it was AWESOME! The Delirium cover art and track list has been released! Sounds like they weren't lying when they said this one would be one of their heaviest. So excited for that collaboration! Am also in love with the new track. Have been blasting it out for the past few days! Am pretty friggen hyped for this! Hope to see them in Sydney. You can find now on Youtube the title track "Delirium". However I doubt that this is an official video, so I wont post the link. No worries! It's official, it was put up by Century Media Records themselves. I like this one a little better than "House of Shame", personally - it's got an oldschool Lacuna Coil vibe to it, but with elements of their current sound too. Like this better that "House Of Shame"
I saw them open for In Flames in 2006, this was when they were promoting Karmacode as their latest album. I never listened to this band much but I am interested since I like the song Cristina Scabbia did with Apocalyptica. Any recommendations for them? How is their newest album? Their latest album is about to drop in May and from the two tracks revealed thus far (both are linked on this page) it seems pretty promising. I was honestly pretty ambivalent about their last album and only really took to maybe three or so songs but it's still worth looking into. What do you think of the songs linked on this page? Do you like the style? I ask because they have been pretty varied in their sound. I'll link to a few songs of their's through the ages, so to speak, so you can get a sense if you might like them. Among fans though, Comalies seems to be the most popular album. At least from what I've seen. To Live Is To Hide. I consider myself a fan of Cristina Scabbia's...and a fan of Lacuna Coil's Comalies and Unleashed Memories. Comalies and Unleashed Memories are both very good records...and I love Cristina Scabbia's voice. Lacuna Coil has lots of great songs. Not sure about albums? I'd be interested to hear album opinions from their biggest fans. Lacuna Coil are my favourite band. Bit recommending them to others is tough...fans of rock took to my recommendation of Dark Adrenaline. Metal fans LOVED Comalies and Goth fans adored Unleashed Memories. I know some prog fans adored In A Reverie. It's tough for me to recommend because I personally love it all. My favourite album is Karmacode, but I have noticed that is one of their least adored albums.